The fuse of car cigarette lighter is about 15A , and power rating is 12V*15A=180 Watt, so Pwsafety 150W car power inverter is a ideal.If you select someone higher and uses a high power device, such as 300 Watt, the fuse maybe burnt. The inverter into the cigarette lighter, and unplug it each time you turn the car off. For car 12V DC only, do NOT use with 24V DC or on airplanes. 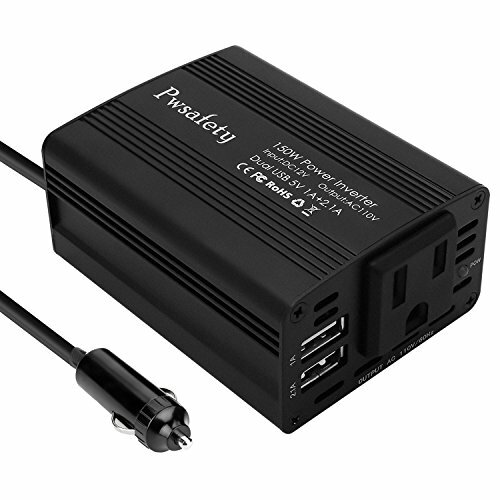 【ULTRA COMPACT】: Pwsafety 150W power inverter for car is super compact, only 3.3 x 2.4 x 1.5 inches, with aluminum shell design, and lightweight at only 8 oz+. If you have any questions about this product by Pwsafety, contact us by completing and submitting the form below. If you are looking for a specif part number, please include it with your message.